“AEROPLANES IN BEDFORDSHIRE – Great excitement was caused in the Bletchley district about eight o’clock Saturday evening, when two aeroplanes were seen coming over Bletchley Station. The first one soon passed out of sight towards Bow Brickhill and Woburn Sands, and news came later that it had descended at Salford. Our Fenny Stratford correspondent reports that Lieut. Reynolds, flying an Army aeroplane had a miraculous escape from death on Saturday, evening. About 8.0 p.m. two were seen by those on the Bletchley-road coming up over Station. The front one was flying to the south of the road, and the second one the north side, but both following the course of the road to Fenny Stratford. The first aviator was soon lost to view in the direction of Woburn Sands, but as the second was going right over the town it was seen begin come down rapidly and then suddenly swerving, turned completely over. Consternation reigned amongst the people, who rushed to the scene, but it took some time to locate the aeroplane, which was eventually found in a field at Sympson, about two miles out of the town. The aviator, to the relief and surprise of all, was practically unhurt, having only sustained slight injuries to one of his arms and hands. What was left of the machine was soon carried off, the crowd seizing upon any available portions as mementoes of the accident. The aeroplanes, it is understood, were making for some army manoeuvres at Thetford, coming from Oxford. From Aspley Guise we learn that just after 7 p.m. on Saturday, the buzz of the engine could be heard, and soon afterwards the machine came into sight. It was evident that the occupant was having trouble and must soon come down, and a large crowd followed it over fields and hedges from Woburn Sands towards the lower end part the village. The machine, after some difficulty with telegraph wires, eventually settled very easily in Mr. Barker’s field, near Higgins’ brickworks. The airman, Lieut. B. B. Kennett, was pleasantly communicative and explained that he had hoped to reach Bedford that night, but owing to a squall after leaving Bletchley, he was obliged to come down. This was the same wind storm that Lieut. Reynolds was caught in when his machine fell at Simpson. The machine was a Bristol Biplane with a 50 h.p. Gnome engine, and was quite new. The Lieutenant and four other officers of the Air Battalion left Oxford the same morning for Thetford, via Cambridge. Lieut. Kennett was leading. The machine was secured with ropes, and P.c. Pegg of Aspley, with Mr. H. Brown, whose farm is near, watched it during the night. Soon after 3 a.m. light had broken, and more than 200 people had reached the field by 4 o’clock when a start was expected to be made. Owing to a strong breeze, Lieut. Kennett, who had been the guest of Mrs. Downes, at Aspley House, on Saturday evening, and had afterwards camped with Mr. Villiers Downes upon “The Warren.” did not put in an appearance until 6 o’clock. He was heartily greeted and the preliminaries having been quickly got through, took his seat on the machine with his map strapped across his knee. To Mr. Villiers Downe was assigned the pleasant task starting the engine, and Mr. G. H. Hall of Woburn, rendered the service of manipulating the propeller until it reached its proper stroke. The cry, “let go” was given, and the machine, after running about 30 yards, gracefully rose in the air, wheeled round the direction the village, and rose higher as it travelled towards Bedford at good speed. The aeroplane passed over Lidlington on Sunday. It alighted at Salford on Saturday night, where it rested until Sunday morning. It passed over Lidlington at good pace, and was fairly low, so that the aviator could be clearly seen. The aeroplane passed over Kempston by way of Spring-road and the Barracks on Sunday morning about 6.40, going in the direction of Sandy. The aeroplane passed over the eastern side of the town of Bedford about 6.45 a.m. on Sunday morning, apparently following the L. and N.W. branch line in an easterly direction. The sky was clear, and a magnificent view was obtained by people in Russell Park and the Newnham bathing place. There was much excitement at Sandy on Monday about 7 a.m., when the burring of a motor was heard the air, and a gigantic bat carrying a man was seen skimming over the houses. The shout ‘A flying machine” quickly brought those who had risen from their beds, into the streets, and those who had been in the grip Morpheus tumbled out and quite unmindful of their toilet, stood gazing from their windows as the machine skimmed smoothly over the houses at no great altitude. It came from the direction of Blunham Station and followed the L.N.W.R. line until it was near The Pinnacle, when it turned to the right and passed over Beeston to Vinegar Hill, where it descended, but only for a few minutes, and was soon seen to rise and make straight for Biggleswade Common, where it again alighted and remained until about 5 p.m. During the day a great number people inspected the machine. This is the first aeroplane to pass over Sandy. This army biplane bore the inscription “Air Battalion, F8 No. 38. The Bristol” It started from near Oxford early on Sunday morning, and about 8 o’clock it descended in a cornfield between Blunham and Willington Stations. Here the aviator let it remain during the day and night, returning to Bicester in a motor car hired at Sandy. On Sunday crowds of people from miles around came to view the machine, and Mr. L. H. Marshall, whose field it was in, organised a collection for the Bedford Hospital, which, we understand was liberally responded to. Lieut. Barrington Kennett, with his Bristol Army biplane, A8 descended at Biggleswade Common on Monday morning last. The news soon spread, and in spite of a heavy rain, hundreds of persons visited the scene. The officer spent the day in the town, and made the ascent at 5.40 p.m. in the presence of large and excited crowd. The biplane rose splendidly, and a demonstration lasting 10 minutes was given by the gallant officer, who very heartily cheered each time he passed over. At 5.30 the airman waved his hand and flew off in the direction of Potton, following the L. and N.W. Railway line to Cambridge, and in four minutes the machine was lost to view. It was a never to be forgotten scene, as this was the first flying machine that had come into the parish. I was looking for the first time a photograph had been used in the press in connection with Woburn Sands, and I think this was it, but sadly the photograph in the article is so indistinct, that there is little point in reproducing it here. However, I have found a photo of Basil Herbert Barrington-Kennett, (left) that shows his plane in better detail, used just a month later. 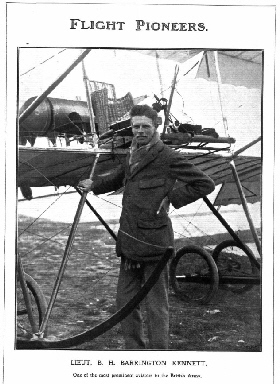 It shows Basil with his Bristol Boxkite, from the September 16th, 1911 ‘Flight’ magazine. You can see how frail it looks, with its tiny wheels, a simple wicker seat and large fuel tank immediately behind where he sat! There is no protection from the elements, no safety gear and no radio. The Beds Times piece above reads as if the editor has run several different reports by different contributors. The appearance of biplanes over 1911 Buckinghamshire and Bedfordshire villages obviously caused great excitement. The 1900 O.S. map of Woburn Sands shows three brickworks, all to the west of Station Road. I am not sure which one was Higgins’. Basil was born in Hove, Sussex, in 1885, (although some sources say 1884), to Lt. Col. Brackley Herbert and Ellinor Frances, and educated at Eton. In 1907, he was gazetted into the Grenadier Guards. He became a keen balloonist, and it is known he took part in the 1909 Hurlingham International Balloon Race, (although he was not placed in the results), and the 1910 Hedges Butler Challenge Cup for Balloons – Long Distance Competition. This seems at odds with the fact that he only obtained his Aeronauts Certificate in 1911! In December 1910, he became just the 43rd person in England to be issued with an Aviators Licence, the scheme of which had only started in March that year. In April 1911, he joined the Air Battalion, and by February 1912, he set a record for flying in a closed loop of 249 miles and 840 yards in a Nieuport monoplane. He stayed with military forces and at the outbreak of World War One he became Brevet Major, in the Military Wing, Royal Flying Corps., serving as their Adjutant. However, after a bout of illness, it was recommended that he was not suitable for desk work, and transferred back to his original 2nd Grenadier Guards unit. He was killed in action on 18th May,1915, aged 30, and buried in Le Touret Military Cemetery, France. He had married, and his wife Rhoda Violet lived in Wraysbury, Bucks. Two of his three brothers also fell in the War, 2nd Lieut. Aubrey Hampden (Ox & Bucks., 20 September 1914) and Major Victor Annesley (Royal Flying Corp., 13 March 1916). Basil is commemorated on his wifes memorial stone in St Mary’s churchyard, Barnsley, Gloucestershire. Villiers Downes, whom Basil camped with overnight in Aspley Guise, was also killed in World War One. The Bristol Boxkite was one of the first aircraft types to be built in quantity, and was used by Bristol for instruction purposes at their flying schools, so many early British aviators learned to fly in them. 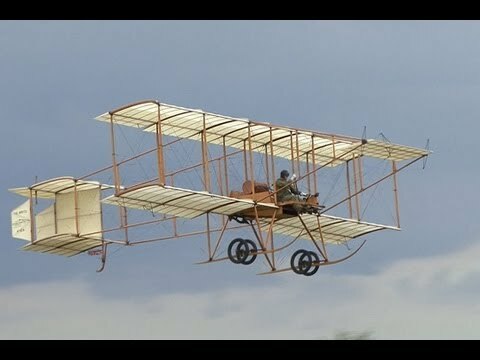 The Bristol biplane was a copy of a Farman biplane, but with substantial improvements which ensured they could not be sued. Following trials with alternative power plants, the 50hp Gnôme rotary engine was adopted and the aircraft flew successfully from Larkhill in July 1910. The Boxkite was issued to the Royal Naval Air Service in March 1911 and to the Larkhill based Army Air Battalion the following April. Some seventy-six Boxkites were built, which was a large number for the period. However, they proved cumbersome to fly and, by 1915, the majority had ceased to operate. Given their flimsy construction, and heavy use in training, it is unsurprising that no original examples have survived. However, three flyable replicas were built for the 1965 film, ‘Those Magnificent Men in Their Flying Machines’, and one of those now resides in the collection at Shuttleworth, Bedfordshire. Click below to see some film of the replica in action. The local residents must have been amazed when this dropped out of the sky and landed. Although steam engines were a common sight, and the railway was nearby, I doubt many private cars had been seen in the village, let alone flying machines! But at least a few had come over before…. In 1910, the Daily Mail newspaper had offered a £10,000 prize for the first flight between London and Manchester in under 24 hours. Claude Grahame-White and French pilot Louis Paulhan competed for it, with Paulham the eventual winner. Grahame-White had spent some of his youth at Bedford, and later went on to found Hendon Aerodrome. “WAVENDON – Our Wavendon correspondent wrote on Wednesday evening that one of the two aeronauts passed to the S.W. of Wavendon on his flying machine, well within sight. The villagers were awfully excited over it.